Parboil the potatoes in salted water for approx. 5 mins., drain, place on a tray lined with baking paper. Place the leek and apples on the tray alongside the potatoes, drizzle with oil. Roast for approx. 35 mins. in the centre of an oven preheated to 200°C. Heat the oil in a large pan, sauté the onion and garlic for 5 mins. Pour in the stock and bring to the boil. Add the roasted vegetables. Puree the soup using a hand blender, season and bring to the boil. 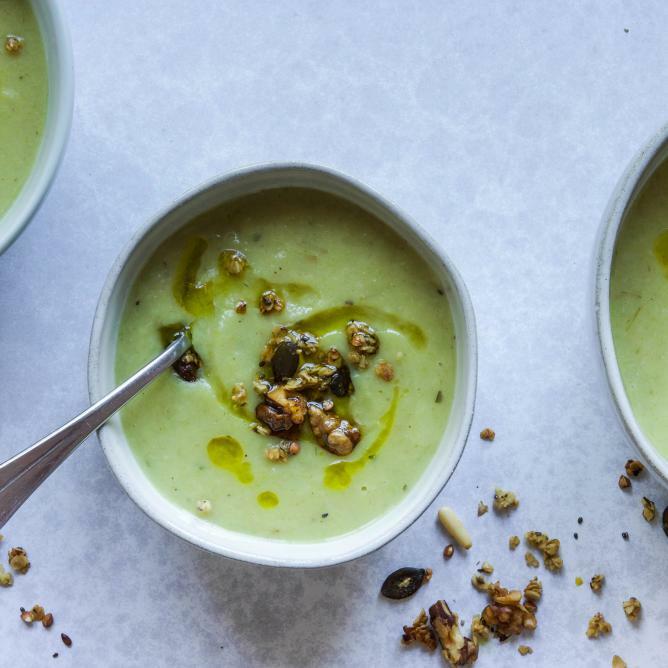 Serve the soup in bowls, garnish with olive oil, pepper and seeds. In order to achieve the same results by roasting as with steaming, simply place a bowl of water in the oven so that the vegetables cook slowly and evenly without catching.